Setting aside the health benefits of strawberries for a minute, I have to say that strawberries are absolutely the shining jewel of the spring. Ever since I was kid, there hasn't been a May that I haven't eaten a freshly picked strawberry and spent more than a few minutes marveling at the complete beauty of the fruit itself, almost overwhelmed at how it could be possible that such a bright red, incredibly sweet, perfectly textured thing could come from a tiny seed. There are always people who say they don't like fruits or vegetables that I adore. Take tomatoes, for example. They're often vilified, and for good reason- if you've only ever tried tomatoes from the grocery store, you probably think they are mealy, greasy, and tasteless. But, do you know anyone in the world who doesn't like strawberries? Well... they're probably out there somewhere. Regardless, there are some amazing health benefits of strawberries that help build my case for why we should eat more fresh local berries in the spring. Fruits and vegetables get their distinctive colors based on the nutrients inside their flesh. Red fruits are generally packed with anthocyanins and the antioxidant carotenoid lycopene. Lycopene's greatest claim to fame is that it helps push free radicals out of your body. Free radicals are any contaminants that could potentially fester inside you and cause serious health problems like cancer and heart disease. Strawberries are also full of vitamin C, which most people know will help guard your immune system against common illnesses. Vitamin C also works to build strong, healthy joints and eyes. During pregnancy, foods filled with vitamin C are important because they help your body absorb iron and protects your tissues from damage. Other vitamins and minerals in abundance in these berries are vitamin K, vitamin B2, vitamin B5, vitamin B6, copper, magnesium, potassium, and even omega fatty acids. Probably one of the coolest health benefits of strawberries is their ability to block pain receptors in your body in the same way that aspirin does. Next time you have a headache, reach for a handful of fresh strawberries instead of that bottle of medicine. You can also reap the health benefits of strawberries during pregnancy as well. They are a great source of folic acid and fiber, so they will help grow your baby's brain and neural tube as well as defend your body against one of the negative side effects of pregnancy... constipation. Each medium size berry gives you about 1% of your daily needs of folic acid. I can certainly think of a few days in a pick-your-own patch where I probably ingested about 100% of my daily needs of folic acid in one sitting. Lucky for parents, strawberries are among the very top of almost every list asking children their favorite fruit. Little do they know the fruit is helping build the memory function of their brains, guarding them against heart disease and cancer, improving their heart health, reducing inflammation, and lowering their blood pressure. Of course, if your children are eating balanced vegan diets, most of their foods should be giving them these wonderful benefits. To get the most health benefits of strawberries, pick fruits that are bright red and firm, with no noticeable soft spots or mold inside the package. Each berry should have uniform color and texture. You do need to eat them pretty quickly, which has never been a problem in my household. I prefer to keep them either on the counter or in on a flat, covered cookie sheet in the refrigerator. I often buy large flats of berries in the spring when they are fresh and save them for the rest of the year. 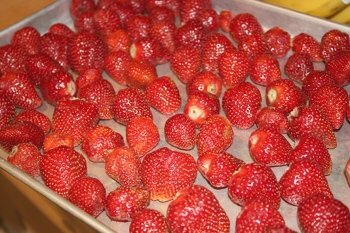 If you want to do this, wipe down your berries with a damp paper towel (running them under water will dilute the flavor), pat them dry, and place them in a single layer on a cookie sheet. Place the sheet in the fridge until the berries are very cold and then directly into the freezer (taking the extra step of getting them cold before freezing will help maintain the shape of the berries when you defrost them later in the year.) 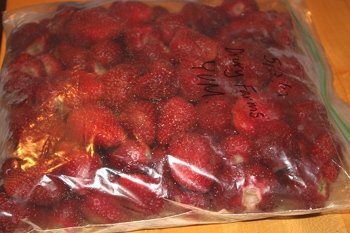 Once the berries are rock hard, you can put them into a sealed plastic bag and use them within six months. You get the most health benefits of strawberries by eating them raw and straight from the farm. 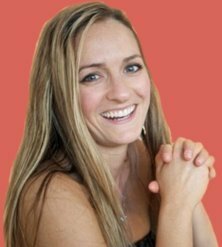 Cooking breaks down the healthful properties, so I try to do as little of that as possible. Also, if you buy strawberries throughout the year when they are not in season locally, keep in mind that they will travel very far to get to you, which means they are picked before they are ripe and ripen with ethylene gas inside a huge chamber. You just don't get as many health benefits from fruit that isn't ripened naturally. 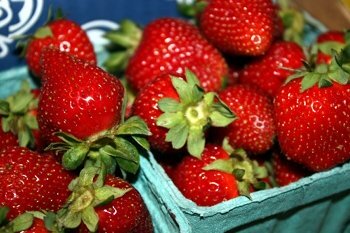 Also, it's very important to buy organic strawberries because they are always one of the top fruits on the dirty dozen fruits and vegetables list, which shows the produce that measures the highest levels of pesticides, fungicides, larvicides, and insecticides. You cannot wash chemicals off a fruit by running it under the tap; the chemicals are inside the fruit itself. This is just one that is best bought local and organic. Here's a fun fact to share with your children: did you know that strawberries are technically not berries? Because the seeds are on the outside rather than inside, they are actually specifically classified as flowers, and specifically as part of the rose family.